Sunday Morning, We Are Heroes for Christ! 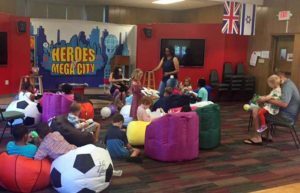 Hero Headquarters is a children’s ministry that starts at 9:00 a.m. and offers programs for infants up to 5th grade. 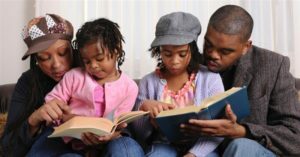 We help families teach their children, to understand Biblical truths, and how to live them out in their everyday lives. There is a promise to First Baptist Church of Greater Cleveland members, to be Bible-based, Child-centered, Christ-centered, relational, relevant, creative and of course FUN! Our summer schedule has changed to work with our one service where we worship together at 10:00 a.m. In the fall during the contemporary service at 9:30 a.m. there are activities for kids. Our main sermon time starts 9:45 a.m. There are serval teaching methods including, interactive, multimedia-driven lessons that drive home a single biblical point, that is delightfully fun and easy to understand. There are monthly themes, and each teaching theme includes independent materials that are an ongoing resource for children and parents. Enjoy FBC’s continuous learning programs offered to families. We love our children. Children bring life and laughter which, creates a wonderful learning environment. Our children and youth, are products of First Baptist Church of Greater Cleveland. They are not alone on this journey, we are a church family, and we want our children, to see and participate in our community of believers learning together. Our Mini Heroes Nursery cares for infants and toddlers. We enjoy contributing to unleashing a child’s faith, in a safe, loving and nurturing environment. The Nursery is open Sunday morning and our paid professional caregivers, teach age appropriate materials in alignment with the lessons taught in Hero Headquarters. Several times throughout the year, the children’s ministry sponsors themed events, trips and extraordinary events. These are family events and we welcome family participation.